A comment of Gavin’s in this post prompted me to reconsider (for the umpteenth time) how best to manage bibliographic references. That we still have publishers printing giant bibliographies in hard copy is a bit obscene, given how most of our bib info now starts out/comes from digital sources in the first place, and most of it ends up digital as well. 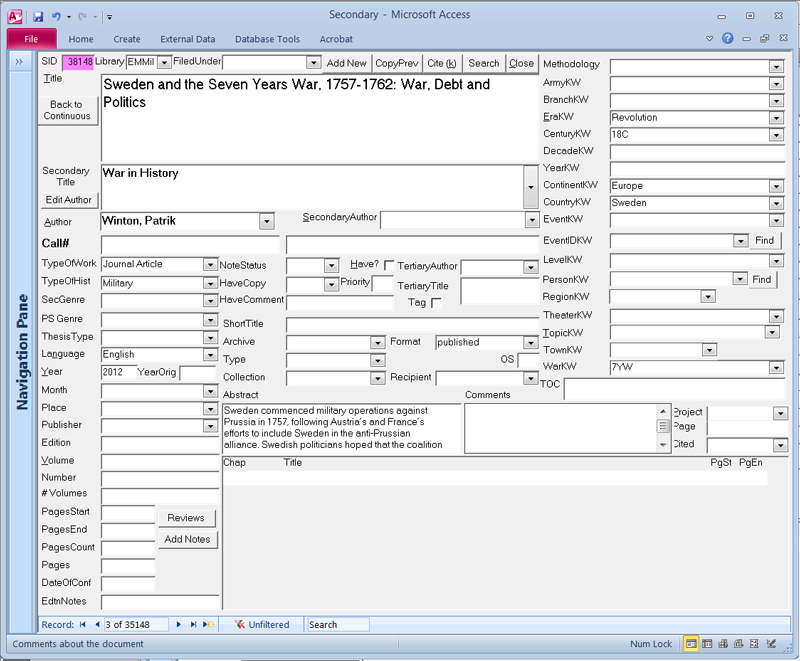 For years many of us have been using computers to manage our bibs: at the least a Word document or maybe Excel, but hopefully something a bit more sophisticated like a database or dedicated bibliographic software. I learned Endnote from my mother back in 1988 – ok, actually I had to learn it in order to teach her, which was difficult when high school senior has no idea why anyone would want to keep track of all that data in the first place. Then in grad school I migrated to a self-designed monstrosity in MS Access back in 2001 or so (see here for the reasons). When I was a postdoc at George Mason I played around with the Zotero add-in for Firefox, but had issues, e.g. constant error messages on startup, not to mention the question of how to coordinate between Access and Zotero. Plus, Zotero’s ability to download records from online catalogs is great, except when it can’t (or at least couldn’t) for several of my libraries, and it doesn’t help that most new records needing entry are single book chapters, which have (or had) no separate online records. So I’ve stuck with my Access bib database – 35,000 publications thus far (and another 40,000 records for primary sources, but that’s another matter). More and more, though, I’m wishing I had my huge database available everywhere: accessible on my desktop/laptop/iPad, in my home office, in my den, in my work office, in the classroom, in the library, at a conference, in the archives… Plus it gets harder and harder to coordinate the various files (even when splitting the database into back and front ends), keeping the versions compatible every time you upgrade, etc. Now that the age of the cloud has clearly arrived, whether it be iCloud or Dropbox or Zotero online or what have you, it seems like it might be possible to do away with this hassle. Add to this the new blog, my ultra-portable iPad, and the fact that I’m also finally getting back into doing archive research (a month-long trip to England in May along with some shorter jaunts elsewhere), and I’m wondering whether now is the time to change, while I still have time left on my sabbatical. The key is to make sure that I’m not losing a lot of the functionality I built into my Access database, as I described on my website mentioned above. As concerns the blog, the question is whether there would be interest in creating some kind of online group bibliography. Obviously I’ve posted all sorts of citations throughout the blog, and several commenters have kindly offered their own references. I have created and shared Google Books libraries (bookshelves) with my students, which has the advantage of allowing full-text searchability. It would be easy enough to post the link to some of those here. But perhaps we might like to create a more general group bibliography of EMEMH? If there was interest in this, I might use it as an excuse to convert my own bib at the same time. Can you link title records to Google Books, either as a link or actually embed the pdfs? Would it be possible to link to other people’s libraries, or otherwise share/duplicate records? Would each user be able to keep their own library, or just rely on the collective library? How easy is it to backup or protect the records from accidental/intentional deletion? Is there a way to limit notes/tags to specific users, or is everything editable by anyone? Will Erik and I get in a fight over whether to use the tag “Austria” vs. “House of Habsburg”? 😉 Any group effort could quickly descend into chaos without some vocabulary control. To everyone: Even if you don’t have any advice about how to do it, let me know if you would be interested in developing some kind of shared online bibliography, and what you would like that to look like. If you have Zotero storage (free up to 100MB, paid above), yes PDFs are viewable online for your own library and for a non-public group library. For obvious legal reasons, pdfs aren’t accessible online (or any other ways) on public libraries or libraries of public groups. Yes, depending on exactly what you need, making your library public or using a group will work for that. There is currently no real vocabulary control, no (though obviously you can see which tags already exist), and tag “fights” (or more likely – unintentionally conflicts) are a real issue, especially for larger groups. It is also currently not possible to fine-tune editing privileges – either a user can edit everything or nothing. Since Zotero is not a cloud-only product, but also always (and necessarily) exists on each user’s local hard-drive, it is very easy to have automated and frequent back-ups of the database using standard back-up software (time-machine on Mac, back-in-time or the like on Linux, and whatever Windows folks are using these days). Thanks for the answers. The more I look at Zotero, the more I remember why I don’t use it for my own note-taking purposes: it’s good for collection, management and citation of a bib, but not as much for note-taking. But it might make sense for the blog for strictly bibliographical purposes. When I get back from vacation I might try to start one for the blog and see how it goes. Regarding keeping separate versions on your own computer, I assume you’d have to coordinate the backup (or only synch manually) so any online changes aren’t automatically made to your own local version. I’m amazed at how annoying that can be with the iPad and iTunes. As my screenshot from my own bib database indicates, it’s important for me to have LOTS of types of keyword tags – separate fields for Country, Theater, War, Event, Army Branch, Century… The problem with a single tag field (something I first realized with Endnote) is that you can’t have 100s of tags floating around together – you’ll never consistently remember to include all the relevant tags (or which synonym you decided on) unless you have visual prompts, hence the need for separate fields for specific types of tags (I have code automatically setting some of them, depending on the values in other fields). To do a search I’ll frequently use several tags at once, so that’s an important feature. Once you get 30,000 entries, there’s a lot to wade through, and the time saved adding new entries (i.e. Zotero’s ability to download entries automatically) isn’t as important as it was when you first start out. I’m pleased that Adam has answered all the technical Zotero questions so that I don’t have to. Whatever you use, covering all of EMEMH is likely to be a big job. I’ve been quite cautious so far: both of the Zotero groups I own have fairly limited scope in one way or another. I didn’t want to take on too much work if the groups got very popular, but in practice it seems that only a minority of Zotero users are active in groups. Understandable. Although in an ideal world an EMEMH library would have to be huge to be of use to many people, i.e. I have very few cavalry sources but oodles of siege sources, whereas someone else has a lot of logistical sources but not many on naval matters… Multiply this by language, country and period. I’m not quite ready to post my list of 30,000 secondary sources online quite yet (which are only in English, French and Dutch, with a tiny number of German sources). In a bit I’ll see how easy using Zotero online would be, and how useful it would be for others. I’d think the key would be to create a culture in which different users would add citations, kinda like swapping trading cards. I’d be happy to put in anything relevant that I’ve got, which is a lot less than you’ve got. My Zotero library is only about 3,000 items and I thought maybe that was excessive and in need of culling! The paradox of Zotero is that it helps me to make bigger and bigger lists of things that I’ll never have time to read. Your observation about tags is spot on: I can never remember all my tags, and what I mean by them sometimes changes, so they’re more of a rough guide than a guarantee of finding everything. I tend to have a collection for each project that I’m working on, or for topics that are relevant to more than one project. In a group on EMEMH it might be useful to have a collection for each war.